On Saturday 24 June 2017 Mary Robinson gave a speech at ‘Toward a Global Pact for the Environment; Action for the Planet, Action through Law’ at the Grand Amphitéâtre of the Sorbonne University in Paris. The event also included speeches from other eminent jurists and climate change advocates including; French President Macron, Ban Ki-moon, Arnold Schwarzenegger, Anne Hidalgo, Laurence Tubiana and Jeffrey Sachs. 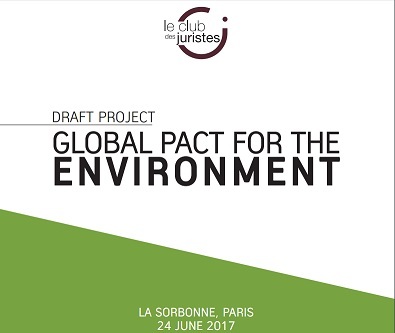 The purpose of the event was to launch a new initiative to agree a Global Pact for the Environment and was chaired by Laurent Fabius, President of the Constitutional Council of the French Republic and former President of the COP 21. A draft of the Global Pact was presented at the conference. The Pact is designed to serve as a binding, universal “umbrella text” synthesizing the principles outlined in the various environmental treaties and agreements to increase coherence and harmony of environmental governance principles. The initiative is being driven by le Club des Juristes, a French legal think tank, with President Emmanuel Macron committed to present the Global Pact to the UN in September. Mary Robinson focused her speech on the urgency of agreeing a Global Pact for people in vulnerable communities, and framing the Global Pact as being ‘about justice… about rights and … a future that we can be proud of for our children, our grandchildren and their children to live in’. The Foundation looks forward to continued engagement in the process for developing the Global Pact for the Environment.